A girl's sweater dress can be a fashionable way for girls of any age to jazz up their cold weather wardrobe. When it comes to sweater dresses, girls, like grown women, will find a huge variety of styles. You'll find sweater dresses with short or long sleeves, in solid colors and in patterns. Some of these dresses are more casual, while others are perfect for holiday parties. Girls who love getting dolled up in dresses will find sweater dresses that fit the bill for fall and winter. Not only can a sweater dress be the perfect school day outfit, but it's also appropriate for parties, church services and other special occasions. Sweater dresses work well with socks, leggings and tights, as well as dress shoes, boots and even sneakers. 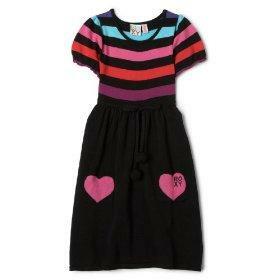 They're a wonderfully versatile addition that girls who love dresses can wear again and again. Stripes and hoods make for more casual selections, but they're no less chic. Sweater dresses may be cut in a straight line, for a basic fit, or with more of a flared skirt, which will provide plenty of twirling action for little girls. Expect plenty of pink and white, but you'll also find bolder patterns and colors for the girl who likes to be more dramatic. Little details like belts, buttons and pockets often add just the right touch to girls' knit dresses. When she needs a dressier look, sweater dresses are widely available with fancier details, like rhinestones, sequins and fake fur. These pretty dresses are great for holiday wear, especially when paired with classic cardigans, Christmas tights or dress coats. Macy's has a variety of sweater dresses that girls will love, from solid colors with a bold, button detail on the side, to sequined-trimmed tunic dresses with accompanying leggings. For trendy but not too pricey girls' clothing, Old Navy is one place to shop. You'll find sweater dresses in adorable designs for girls from babyhood and up. Target is another budget-friendly retailer to check out for sweater dresses for girls. If you want a truly unique sweater dress without having to spend much at all, try taking an old sweater of your own and refashioning it into a dress for a little girl. Don't have an old sweater you want to use? You can always pick one up for cheap in your local thrift shop - for anyone who loves to recycle, this is a great way to breathe new life into an old, unwanted piece. This sweater-to-sweater-dress tutorial makes it easy to redesign a grown-up sweater into an adorable dress. Whether you buy a brand new girl's sweater dress or you recycle an old sweater, there's plenty of variety out there to suit many different occasions. A girl can have dresses for casual events, as well as dressier sweater dresses for fun parties. For school, play and those times she gets to dress up, sweater dresses are a chic and versatile way to keep her warm and stylish during cool weather.